Essential instruction manual template for all manufacturers, importers and distributors that trade machinery within the United States to pass customs with no delays, be able to sell your machinery within the US and decrease liability. You want to import, trade and/or sell your machinery on the U.S. market? You want to do this according to the legal requirements to avoid problems at customs or to decrease liability? We have developed a user manual template to make it happen. A lot quicker and easier than you ever imagined. NOTICE The user manual template does not comply with any product specific requirements, as may be required by mandatory or voluntary product standards. A user instruction’s function is to explain to the user how a product can be used safely and correctly. The user manual informs the user about risks that still persist, despite the adoption of measures for inherent safe design, safeguarding and complementary protection. Failure to warn the user properly can make the manufacturer liable in case of any accidents. That’s why the duty to warn/provide instructions with the products is regulated and often mandatory. 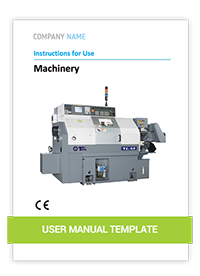 The User Manual Template is a MS Word file that contains all mandatory elements, as required by the Code of Federal Regulations; Adequate User Instructions for Machinery.